Dynamic analyses reason about a program’s concrete heap and control flow and hence can report on actual program behavior with high or even perfect accuracy. But many dynamic analyses require extensive program instrumentation, often slowing down the analyzed program considerably. In the past, researchers have hence developed specialized static optimizations that can prove instrumentation for a special analysis unnecessary at many program locations: the analysis can safely omit monitoring these locations, as their monitoring would not change the analysis results. Arguing about the correctness of such optimizations is hard, however, and ad-hoc approaches have lead to mistakes in the past. 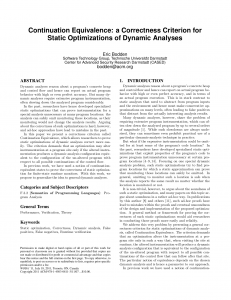 In this paper we present a correctness criterion called Continuation Equivalence, which allows researchers to prove static optimizations of dynamic analyses correct more easily. The criterion demands that an optimization may alter instrumentation at a program site only if the altered instrumentation produces a dynamic analysis configuration equivalent to the configuration of the un-altered program with respect to all possible continuations of the control flow. In previous work, we have used a notion of continuation-equivalent states to prove the correctness of static optimization for finite-state runtime monitors. With this work, we propose to generalize the idea to general dynamic analyses.